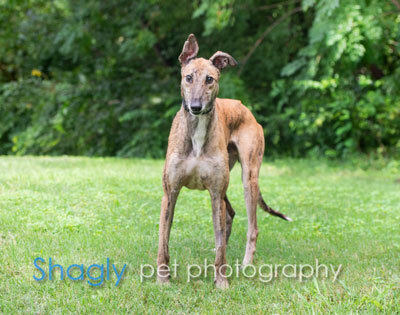 Sheriff is a 5 year old male brindle greyhound found as a stray in Tulia, TX born in June 2013. His registration number is very, very faint, but we are trying to decipher. Sheriff has been seen by an animal optomoligist to confirm that he is totally blind in his right eye due to retinal atrophy, and unfortunately the left eye is in late stages but still has some sight. Over time this eye will deteriorate to total blindness. He is in no pain from this condition. Because Sheriff arrived as a stray, there is no way to know the cause. It is not known at this time if Sheriff is small animal or cat tolerant. Sheriff may be visually impaired and will eventually be completely blind, but he wants you to know it doesn’t stop him from living a good life. Although he currently has limited vision, he quickly learned his way around our house and yard and now navigates there very well, even in the dark. He goes straight to our back door to let us know when he needs to go out. Sheriff is a sweet, good natured boy. 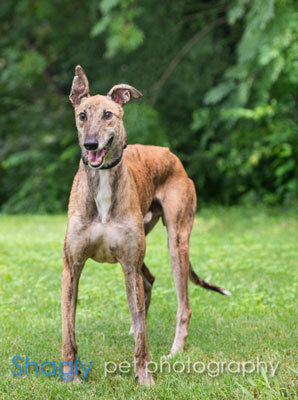 He gets along well with our dogs and has been friendly and sociable with people he meets. He likes to hang out with people and will quietly follow you from room to room. Sheriff enjoys toys and has been known to occasionally steal a shoe or piece of clothing from us. He isn’t destructive with his finds, he just wants to carry them off. Sheriff walks well on a leash, either on a single leash or on a double leash with another dog. On walks, he seems to be most comfortable walking right beside a person or another dog. When we walk, we are practicing the commands left, right, step up and step down to help him navigate. Although he always enjoys going for a walk, he isn’t a high energy dog and is content with short daily walks. He is generally a quiet dog but will bark if he hears a strange dog or person outside the house or if something startles him. Sheriff’s happy place is stretched out on the couch beside a person who will pet him.